Pro-ject announces brand new 6 PerspeX turntable | What Hi-Fi? The brand new 6 PerspeX deck looks no different at first glance. There's the stylish, transparent, acrylic plinth, the substantial, non-resonant platter and a the carbon fibre, single piece tonearm. Perhaps the most eye-catching technology is the magnetic suspension, which allows the turntable and arm to be mounted on a sub-chassis that floats above the plinth thanks to three pairs of aligned magnets. The new Pro-ject 9cc Evolution tonearm is here too, fashioned from a single piece of carbon fibre in an effort to ensure the highest possible build quality and overall rigidity. All this technology, and plenty more beside, is yours for £1000. 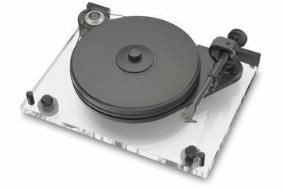 For more information on the Pro-ject 6 PerspeX turntable, check out the website of Henley Designs, the company's distributor, here.